This classic timepiece by Michael Kors offers a rose goldtone stainless steel case and bracelet. The watch features a rose goldtone dial, a precise quartz movement, and a water-resistance level of up to 100 meters. I love this watch. I have recieved many compliments on this watch. It was admired by both men and women. I love the rose gold. It matches back to all of my rose gold jewelry. I am looking for another one of his watches to purchase. 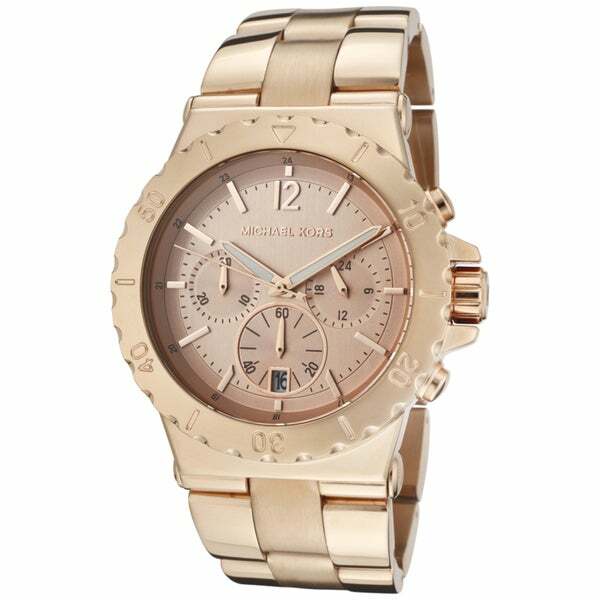 I was looking for a boyfriend-style rose gold watch for awhile when I found this Michael Kors and a few other Kors watches in the women's category on Overstock. When I compared this to the others, I concluded that this one was the smallest of the bunch and pretty great looking. I ordered it right away. When I received it, though, it turned out to be way oversized for me -- I'm just 5'1" and not plus-size. I just couldn't carry it off, so I returned it. It's such a beautiful watch, I felt torn about sending it back. But I know what looks good on me and what doesn't, and I'd have to either pack on the pounds or grow 6 inches to wear this watch. I love the color of this watch!! I can wear my silver or gold jewelry with it and it still matches. I get more compliments on this watch then any other piece of jewelry I own. I did have to have a few links removed but that wasn't a big deal. I love the oversized style of the face. It's very trendy and has that "masculine" look but still maintains great feminine touches. It's the second Michael Kors watch I own and they are both gorgeous, of great quality and I will absolutely recommend purchasing this item. I wanted a large, rose gold watch, and this was the one. Love it! Michael Kors watches are high quality and this is no exception. I love the design of this one. I would definitely recommend this watch to others. Love it! It is a great watch at a great price. I would recommend. This is bigger than most men's watches. How the heck is a woman supposed to wear this? Unless she 6ft and has huge arms. Otherwise this was a waste of my time. Thank goodness I did not rely on this for a birthday or a special occasion. Quality is great as with any Michael Kors items. Just the sizing is ridiculous. Terrible Quality and not help from Overstock! The watch came as expected. Loved the size and color. Within the first 2 months the watch started to tarnish and discolor. I called Overstock and they gave me a number to call to return the product and the number was not in service. I called Overstock several times after that and am still waiting for a return phone call. So disappointed with the poor quality of the watch and the lack of customer service from Overstock! My daughter loves the watch .